Today it’s St Patrick’s Day! With 10 times the population of Ireland in the US claiming Irish ancestry, one in four Britons doing the same, and countless more in other countries around the world, it seems that people wishing to become ‘Irish for the day’ have opted for the green of the Irish flag to express their Irishness. In fact, in the US, if you don’t wear green on March 17, people pinch you, so it’s not uncommon to spot folks sporting hand-drawn shamrocks on their cheeks. Some cities like Chicago dye the entire Chicago River green just to mark the big day! This is done as well in one of the fountains in the White House. St Patrick used this simple gree n herb to explain the concept of The Holy Trinity – The Father, The Son and The Holy Spirit – and how they could all exist as separate elements of the same entity. His followers adopted the custom of wearing a shamrock on his feast day. The Irish didn’t always look so kindly on donning the colour green. 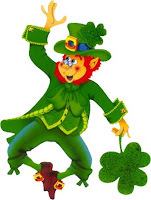 Irish folklore considered the colour unlucky as it was the favourite shade of the Good People – particularly leprechauns. Those who wore too much of the colour – especially children – could be stolen away. Some cynics may tell you there are no such things as leprechauns, but there are those who believe in the whole tale. A Leprechaun is a smart, wild little thing and who’ll do anything to escape capture. They are shoe-makers. 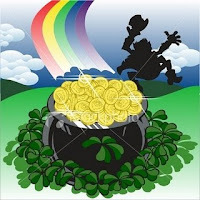 It is said that every Leprechaun has a pot of gold, hidden deep in the Irish countryside. To protect the leprechaun’s pot of gold the Irish fairies gave them magical powers to use if ever captured by a human or an animal. These pot of gold are said to be hidden at the end of the rainbow! Leprechauns are also very keen musicians who play tin whistles, the Irish Harp and various other Irish traditional instruments. Finally, we give you now some clues on how to celebrate St. Pat’s day with a nice dinner and beer galore! Watch these two videos from CBSNews.com talking about what to eat and drink today. Acceder | 43 queries. 1,022 seconds.